The capacity of wireless data communications is lagging behind demands due to unsatisfactory performance of the existing wireless networks, such as low data rates, low spectral efficiency and low quality of service. Space-time coding is an effective transmit diversity technique to combat fading in wireless communications. Space-time codes are a highly bandwidth-efficient approach to signalling within wireless communication that takes advantage of the spatial dimension by transmitting a number of data streams using multiple co-located antennas. There are various approaches to the coding structures, including space-time trellis coded modulation, space-time turbo codes and also layered architectures. The central issue in all these various coding structures is the exploitation of multipath effects in order to achieve very high spectral efficiencies. The spectral efficiencies of traditional wireless systems range between 1-5bps/sec/Hz but by using space-time techniques spectral efficiencies of 20-40bps/sec/Hz have been possible. Hence, space-time coding enables an increase in capacity by an order of magnitude. This is the main reason why space-time codes have been included in the standards for the third generation wireless communication systems and ultimately why Space-time Coding will be in great demand by individuals within industry and academia. 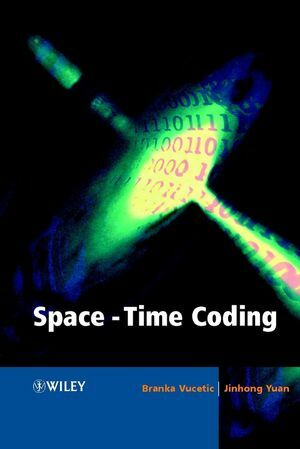 The comprehensive understanding of space-time coding is essential in the implementation of 3G, and as the only title currently available, Space-Time Coding will be the standard text for Researchers, telecommunication engineers and network planners, academics and undergraduate/postgraduate students, telecommunications managers and consultants. Branka Vucetic is an Australian-based expert in coding theory and its applications in wireless technology. She works at the University of Sydney where she holds the positions of ARC Laureate Fellow, Peter Nicol Russell Chair in Telecommunications, and Director of the Centre of Excellence in Telecommunications. Jinhong Yuan is the author of Space-Time Coding, published by Wiley. Performance Limits of Multiple-Input Multiple-Output Wireless Communication Systems. Space-Time Coding Performance Analysis and Code Design. Space-Time Coding for Wideband Systems.